Departures Year-round except February. We recommend to pre nights in Lima. The soaring peaks of the Andes and the enigmatic Inca civilization beckons with the allure of the ancient and mysterious. From Cusco to Macu Picchu, from Ollyantaytambo to the coulourful markets, our tailor-made signature journey to Machu Picchu and the surrounding areas most significant sites will stay with you long after the trip has ended. Our sample itinerary covers most of the important sites. We can tailor this trip to your choice of hotels and desired length of stay, adding a few days in Lima or in the Amazon. Contact us for pricing and details. info@eviactive.com. Check out our suggested deluxe and luxury preferred hotels. Our guides greet you at the airport in Cusco for a private transfer to your hotel in the Sacred Valley. The Sacred Valley is at a lower elevation than both Machu Picchu and Cusco and starting here helps the traveler acclimate to the high altitude. * There is time upon arrival to to settle in and have a light lunch. 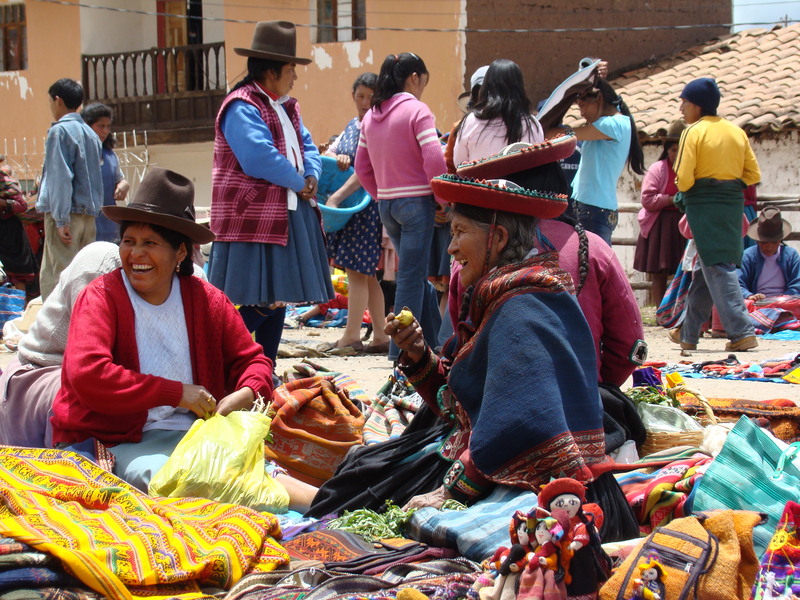 In the afternoon there is a private guided visit the colorful and lively markets of either Pisac or Chinchero. We will stop to visit local weavers, learn about the 2,000 year old weaving techniques of the Incas, and its importance to contemporary Andean culture. If time permits, our guide will take you to visit a ceramic seminario where you can see finished products of per-Columbian ceramic replicas. Surrounded by tall eucalyptus trees and green mountains, the Sol y Luna offers a perfect place to relax after a busy day of walking and touring. Hotel Tambo del Inka is where luxury meets culture in a perfect blend. Belmond Rio Sagrada is a place of retreat, escape and wellness with the noisy Urabamba river flowing nearby. Today our guide takes you for a short acclimatization hike from the Maras Salt Mines down into the Sacred Valley. Explore the imposing Inca Fortress at Ollantayambo, a massive stone structure perfectly sculpted into the mountainside by ancient Incan craftsman. After hiking through the ruins, we take a walking tour of the quaint Peruvian town below and enjoy a short visit to one of the most beautiful towns in the Sacred Valley, with its cobblestone streets and town square. Lunch at a local hacienda to delve into the Peruvian cuisine. Afternoon at leisure. Say good-bye to the Sacred Valley and take in the scenery during the train ride. Two options are available. Stop at marker 104 and hike the 7 hours up the ancient stones and stairs of the Inca trail to enter Machu Picchu through the “Gate of the Sun” or take the train to Aguas Claiente where you will be met by an expert guide who will take you for your first awe inspiring visit to Machu Picchu. Whichever option you choose, you will marvel over the intricate stonework of the Inca’s lost city. Part of the fascination includes learning about the special astrological symbols. Permits are required for the Machu Picchu and the Inca trail. We take care of the details. lead time of 60 to 90 days is required. Accommodations: Inkaterra Machu Picchu or Sanctuary Lodge (B, L, D). Located deep in the lush Andean cloud forest, the Inkaterra Machu Picchu Hotel is made up of one and two story white-washed cottages constructed with local materials. Meet with your guide before breakfast for an early morning and less crowded your of Machu Picchu or take a short hike to the cloud forest to explore ancient Inca pathways. Farewell lunch at the Inkaterra followed by a late departure for the train station and onto Cusco on the Vistadome or Hiram Bingham Train. Our return to Cusco is late due to the length of time for the train ride. After breakfast our guide will pick you up at your hotel for an orientation walk in Cusco followed by a drive to the impressive site of Tambomachay, the site of ritual baths and the Temple of the Water. You will enjoy and a short downhill walk to the old Inca fortress of Sacsayhuaman, the scene of the last battle between the Incas and the Spanish. Evening on your own. Our guide will suggest restaurants specializing in Peruvian cuisine. In 1995 the ancient Spanish Monastery, originally built in 1595, was converted into a world class hotel.. It is located in Cusco’s historical center. After breakfast you will have time to walk around on your own, or shop for local products. Our driver will pick you up at your hotel after lunch for a transfer to the airport and flight back to Lima. All bookings through Voyage GAM-SPS Travel, Quebec Licensee. * Important Note: In order to preserve the environment, permits for the Inca trail are limited and are issued on a first-come, first-serve basis. We recommend booking at least 90 to 120 days in advance in order to obtain a permit. * Personalized Departure Dates: We can customize any of our trips to begin on a date that is convenient to you. Supplemental charges may apply. You may want to consider arriving a day before the trip starts to better adjust to the effects of high altitude. Best time to travel April to October.